The day today running of business enterprises is determined by the managers’ decisive roles, which among other things includes inspiring and leading workers in performing their assigned work in the most effective and efficient way. Therefore, it is imperative that managers need to understand, discern, reorganise individual and team behaviours in their organisations to deliver results in accordance with vision, mission, goals and objectives of the organisation. The current trends taking place in organisations is that culture, values, power and formal authority define the relationship between employees and managers and quickly replacing yesteryears command and control form of management. In this management report, a case study of Wal-Mart in relation to organisational behaviour has been undertaken. The company’s vision was to be the best retailer in the hearts of minds of consumers and employees while its mission was saving people money so they can live better is currently faced with various systemic problems such as low motivation that emanate from low pay, poor working conditions and racial and gender discriminations that has resulted into many lawsuits. The lawsuits have put the company’s vision, mission, goals and objectives into jeopardy. Organisational behaviour is an important knowledge area to understanding these problems and provides recommendations. Accordingly, the issues facing Wal-Mart have been analysed using organisational behaviour and evaluation of the causes of these issues undertaken and the best possible course of actions in preventing unwarranted emotional, financial and legal implications have been recommended. Therefore, incorporating new forms of practices, investing “in employees” through training, workshops, seminars, good pay package, providing bonuses, overtime pay and ensuring that workers function as teams and involving employees in the decision-making process are some of the important ways of improving performance of workers. Wal-Mart has been in the business of retail for many years. The organisation structure of Wal-Mart Stores is hierarchical and function-based. The hierarchy consists of vertical lines of commands. The directives from top management are implemented by middle managers in Wal-Mart Stores by being castigated down to low-cadre employees in the individual stores. The function-based departments include human resource, information technology and marketing department. Organisational culture of Wal-Mart includes service to customers, strive for excellence, respect for individual and action with integrity. However, there is lack of trust between managers and low cadre employees on issues of low pay, poor working conditions and racial and gender discriminations. These issues have affected the morale and motivation of employees at Wal-Mart resulting into frequent strikes. Wal-Mart has been frequently in the news media for employee welfare violations related abuses with most recent being the employee class action suit in a Californian court. A number of issues emanating from the frequency in which employees at Wal-Mart are suing its employer bring to the fore pertinent questions on whether the employees at Wal-Mart are disengaged exceedingly and litigious or whether the employer is overarching relationship is hurting its employees and raising contentious issues. Among the most prominent is Duke v. Wal-Mart Class Action suit, the wage and hour claims against Wal-Mart that was dismissed by the court and Wal-Mart Stores was also sued by Equal Employment Opportunity Commission (EEOC) for discriminating against disabled employees in 2011 (1). The root causes for the court cases stems from violations of racial and gender discriminations, low wages and inadequate health care and poor working conditions for the employees. The current state at Wal-Mart pointing to faltering chain of command with subordinates viewing their immediate corporate leaders and managers as part of the problems afflicting. The low motivation among the workers at Wal-Mart directly impact on work productivity through frequent strikes. This report examines the issues at Wal-Mart, takes a close analysis using MARS Model and Motivational Theories in order to ascertain the causes of the issues and provide, and based on the causes, remedial mitigation measures to resolve the issues. The role of an individual in organisation like Wal-Mart is significant and helps to define its success. 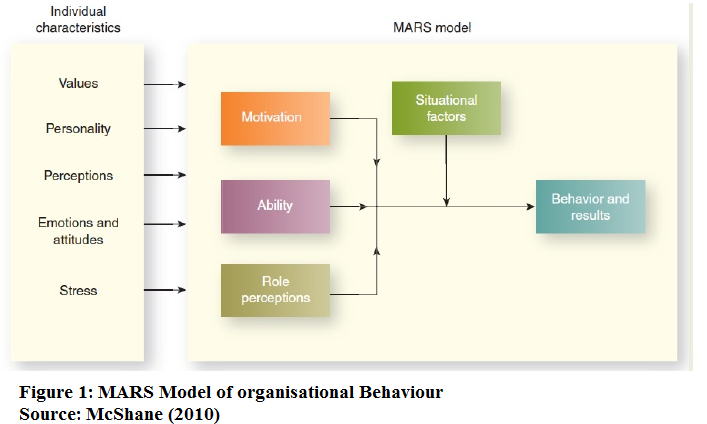 The MARS model is defined by individual behaviours and includes motivation, ability, role perceptions and situational factors that drive an individual in an organisation. These individual behaviours are related to personal development, personal traits and how personality generally relates with organisational behaviour. The figure below gives the relationship between individual characteristics and how these characteristics maps onto the MARS Model. Motivation is the inherent forces within an individual that determine the person’s direction to be taken, intensity and persistence through voluntary behaviours (2). Motivation existing within the individual is not the individual’s actual behaviour. Therefore, direction, intensity and the persistence of an individual are part of the cognitive (thoughts formation) and emotional conditions, which make employees to work without prompting. 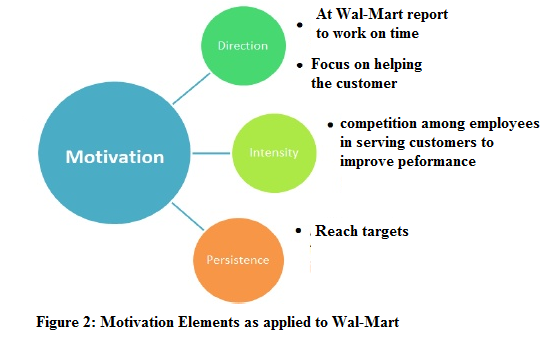 The figure below gives a visual representation of motivation theories relations and the aspects of direction, intensity and persistence in an individual working at Wal-Mart. In order to describe the motivational needs of employees working at Wal-Mart, Maslow’s Hierarchy of needs, Herzberg’s two factor and Alderfer’s ERG needs theories are used. The figure below provides clearly, the different levels and how the three theories are related. Maslow’s Hierarchy of needs theory has one limitation relating to gratification of one at one level does not automatically result into increased motivation that would satisfy the next hierarchy higher level of need. In order to remedy this, Alderfer (3) proposed and developed ERG theory of needs. The ERG theory categorises human needs into three groups: growth, relatedness and existence. The existence needs level correspond to Maslow’s hierarchy of physiological and safety needs. The relatedness needs level correspond to Maslow’s belongingness of needs that is love and belonging. The growth needs level related to Maslow’s hierarchy of self-actualisation and esteem needs. 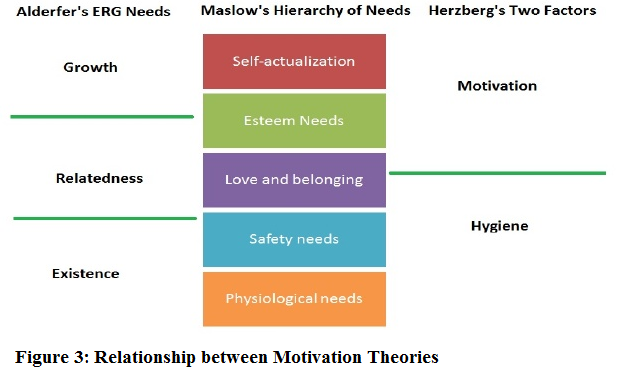 Herzberg’s theory of needs is also related to Maslow’s theory of needs in which hygiene factors correspond to low-level needs of Maslow’s theory such as safety and physiological needs. The restrooms at Wal-Mart have been reported to be very smelly and unrepaired. These are needs, which after being met only prevent dissatisfaction; however, they do not result into satisfaction. Abraham Lincoln was known for keeping the American soldiers motivated during the war between the North and the Confederate by frequently visiting the soldiers in their camps and kept communicating with them, which fulfilled their needs for relatedness (4). Therefore, a cashier or stores clerk working for Wal-Mart might not be motivated to do their work for the company if the is lack of relatedness. According to Daft and Marcic (5) if managers are perceived to belonging to their own different class will cause lack of cohesiveness in the organisation and become difficult in achieving the goals of the organisation. According to Sam Walton, Wal-Mart’s founder advocated for low wage for its employees that result into low price for its products creating low-benefit employment model, which is perceived as a successful model for Wal-Mart (6), which resonates well with its mission statement: saving people money so they live better. These measures of low-pay for its employees have been deemed necessary to enable it remain competitive. Wal-Mart has faced lawsuits for forcing employees work-off the clock without extra compensation (7). Wal-Mart has been settling these lawsuits for over its minimum wage violations as a result of pressure from employees, union workers and Equal Employment Opportunity Commission. The low pay rates do not motivate the employees of Wal-Mart and has been a contributing factor in the rising number of strikes. These constant suits negate Wal-Mart’s vision: To be the best retailer in the hearts and minds of consumers and employees (8). Employees of Wal-Mart need direction, intensity and persistence attitudes in keeping up with their duties will require the fulfilment of their basic needs. This can be achieved through their jobs by being paid good salary, a good medical insurance, bonuses, overtime and paid leave, good working conditions and lack of discrimination based on gender, which can fulfil Alderfer’s growth needs, Herzberg’s hygiene of needs and Maslow’s physiological needs. The moment these needs are met, employees at Wal-Mart will be motivated and will be working towards reaching the next higher level of satisfaction. Each level of motivation is related directly to satisfaction level which is attained after fulfilment of needs. At Wal-Mart some of the needs are supposed to be organisational driven such as number of hours worked sales and target achievements while others such as promotions are self-driven. The employees’ abilities are important in the performance of their tasks, which is dependent on their behaviours. The employee ability includes natural aptitudes and learned capabilities. Natural aptitudes include natural talents that can help in the completion of a task faster and much better. The learned capabilities are knowledge and skills that have been acquired through experience and are important in the successful completion of tasks. Competencies such as knowledge, skills, aptitudes and personal characteristics of an individual are important in performing a task. These competencies are divided into technical competencies, human competencies and business competencies (9). Technical competencies are applied by operational level workers, human competencies are applied by human resource managers and business competencies are applied in roles such as public relations, sales and marketing. Abraham Lincoln was a great leader and as the president of America during the civil war undertook inventory of competencies of the military and political leaders of the time before embarking on new appointments (10). Managers at Wal-Mart need to identify their employees’ competencies before assigning them jobs without considerations of gender and racial inclinations. The assignment of tasks should be solely done based on competencies to avoid issues of discriminations arising. When examining the situation obtaining at Wal-Mart, the dissatisfaction that have led to lawsuits due to job assignments, which are done discriminatively based on racial and gender status resulting into poor motivation. For employees lacking requisite skills, training them into those competencies is a good option to obtain diversity and avoid lawsuits and low motivation. The extent of employees understanding of their job duties and responsibilities and the expectations is what constitutes role perception. There are three components of role perceptions (6). The employees are deemed to have good role perceptions if they are able to understand their specific task assignments All the employees have their job descriptions well documented. The reasons for persistent strikes are because of the conflicts between the managers and the subordinate employees at Wal-Mart. The best way to resolve these problems to assist employees know their duties and the role expectations. The situational factors at Wal-Mart include conditions that are beyond employees’ immediate control, which constrain and facilitate behaviours that impact on performance negatively (11). Situational factors at Wal-Mart such as political, market demand and economic conditions have their origins in external environment and beyond employees and Wal-Mart’s control. However, situational factors like people, time, physical working conditions and budget are within the individual’s control and can be controlled by Wal-Mart. Poor working conditions at Wal-Mart include understaffed and poorly run stores, which affect workers as those who are few are forced to do more. The aisles in some of the stores are not passable making it difficult for the employees to access merchandise for sale in pallets contrary to Wal-Mart’s mantra of “in-the-door and to-the-floor”. The cut back on labour hours by the management and in the process created problems for physically moving merchandise onto store shelves from the back. The health insurance scheme for employees does not cover adequately some cadres of employees. This contributes greatly to poor working conditions at Wal-Mart. In addition, it defeated the Wal-Mart’s objective of Making Quality Healthcare More Affordable and Accessible. There have also been reported cases of racial and gender discriminations as demonstrated in case of Dukes vs. Wal-Mart Class action suit (12) in which women of African-American origin were denied promotions. Wrongful cases of termination of employees are also rampant have been brought up before courts. The culture at Wal-Mart seems to be in chaos. A culture gives an organisation a sense of purpose and direction. There is no value-based culture that embodies a sense of respect for managers and the entire organisation. The employees go on strike because they do not feel that the organisation is listening to them and the managers are not anywhere close to them. According to Schein (10) leaders who are entrepreneurs are also regarded as architects of their organisations culture. The leaders play a pivotal influence on the kind of culture infused into the organisation and they are responsible for speeding up culture change. Issues of low pay, poor health insurance scheme for employees and discrimination based on racial and gender inclinations at Wal-Mart require infusing a strong culture that espouses equal work equal pay, good health corresponds to a health Wal-Mart and diversity is a global benchmark that is potential in the successive running of Wal-Mart. The management should examine reward scheme without imposing undue pressure on the companies pricing model. The managers should ensure that rewards are intricately linked to performance of duties, aligned with performance, which are within employees’ control and institutionalise team rewards as part of facilitating team function. Other means to reduce incidences of strike is get feedback from the employees on decisions to be taken using Johari Window (13). 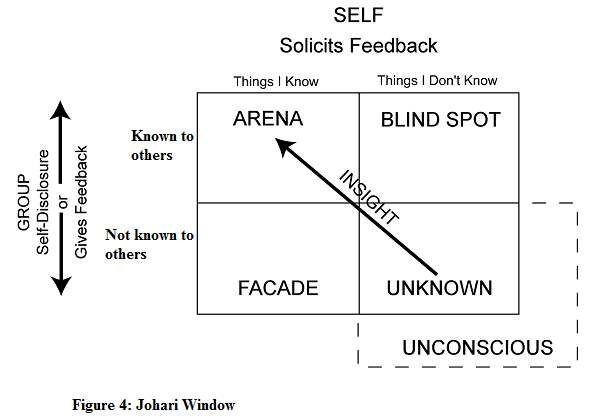 To better understand how this can be achieved is to use Johari Window shown in the figure below. Through Johari Window both employees as individuals and Wal-Mart managers can understand each other and work together to benefit the company. The information given by employees will enable managers to see how their behaviours affect them and what is perceived through self-disclosure. In this way, management can devise strategies like increasing salaries of its employees, bonuses to curtail strikes (14). The issues identified include low pay, discrimination based on gender and racial and poor working conditions reflecting a dysfunctional culture that does not embody sense of respect for others as espoused by Wal-Mart. Wal-Mart’s policy of low pay for its workers, hierarchical structures and practices with power and authority vested in managers to control payrolls cost without controlling the supplier costs contribute to the problem of paying workers lowly and contributing to strikes. In order to address constant strikes at Wal-Mart, there is need to improve pay package, which will be line with the company’s belief in a culture of respect for individuals and allowing managers to controlling supplier costs. When managers control supply costs, they are likely to buy at low cost, which will translate to reduced costs and the benefits transferred to higher salaries for the workers. Improving pay package for employees has its roots in MARS Model and Motivational theories of management. There is need to make changes to management system by introducing monitoring systems and control the implementations of the actions to achieve desired changes. McShane LS. Organisational Behaviour: Emerging Knowledge and Practice for the Real World. 2010, John Wiley & Sons, Inc.
Accord D. What would Lincoln Do? Lincoln’s Most Inspired Solutions to challenging problems and different situations, 2009. Dimarco C. Pennsylvania Court finds Wal-Mart Stores required employees to work through breaks and off the clock. Inside Counsel Breaking News, Dec. 16, 2014. Edelson S. Protesters Target Stores in Cities Across US (Wal-Mart Workers protesting for high wages). WWD, 2014, vol. 208(111), p.7. Luthens F. Organisational Behaviour, Irwin, 2008, McGraw-Hill/Irwin Companies, Inc.
Bacharach SB, Bamberger P. Beyond Situational Constraints: Job Resources Inadequacy and Individual Performance at work. Human Resource Management Review, 1995 Sum, vol. 5(2), pp.79-102. Beck CE. Perspectives on the self-in communication: The Cognition-Continuum and the Johari Window. Technical Communication, 1994, vol. 41(4). Goldsmith M. Best Practices in Talent Management: How the World: Leading Corporations Manage, Develop, and Retain Top Talent. 2010, John Wiley & Sons, Inc.